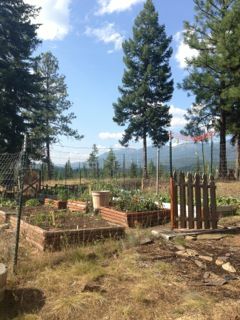 Pest Control - My tips for controlling pests in your vegetable garden. Pest control in your garden is important especially if you find your vegetable plants are being destroyed. There are many pests that can come into your garden from small animals like gofers, rats, cats, birds, slugs, snails and larger animals such as deer, racoons, bear and elk. It is important to remember when gardening we often have to learn how to coexist with animals. This can be difficult especially if they are eating up our hard work. I remember when I was farming on a larger scale we were going to pick our 100 feet of greens beans and when we arrived that morning we found that they had been eaten to the ground by a herd of elk. Lesson learned - when you are dealing with larger animals the best defence is a fence. Preventing smaller animals can be even more difficult as traditional fencing does not always work for pest control. Gofers are a good example as they burrow up from under ground. The best method I have found if gofers or rats are problem in your area is to grow vegetables in raised bed. Place wire fencing at the bottom of your bed (ground level) and then cover it with the soil. Choose a wire fence that has small holes, inch or two square is probably the largest you want. Cats or raccoon can be a use problem as they can easily climb fences. 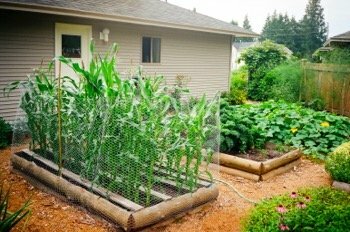 For keeping cats out, build a chicken wire structure four sides and on top to cover your vulnerable plants especially when young as cats love to dig them up. Plant your vegetable close together so as the plants grow there is less space for cats to dig. With raccoons, they love corn especially when the heads are ripening. I put up fence of chicken wire around my plants and that kept them out. Slugs and snails are best picked off and destroyed. They come out around dusk and that is the best time to look for them. They can travel great distances so moving them to another area is not a solution. I have tried lime and egg shells, however picking them off have given me the best results. For animals such as birds, netting is probably the best way to go, although they can be helpful as well. Even though there are lots of beneficial insects as listed above there are some that can do damage, Check out our page insect control for a list of common insects that can cause havoc to your vegetables and what to do about them. There are other strategies for control so you can prevent any damage happening to your vegetable garden.